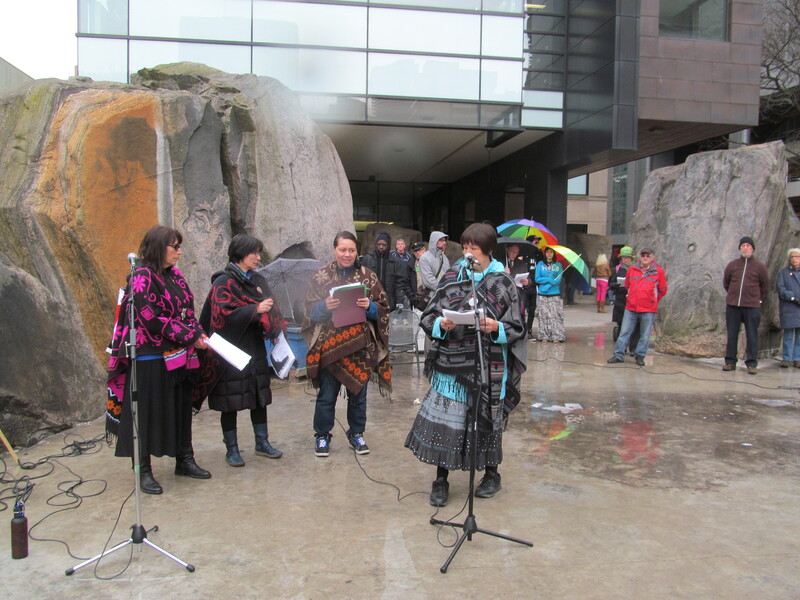 the artificial pond on the Ryerson University campus, native women calling themselves Water Keepers lamented the neglect and damage done to what is an essential, sacred gift, the gift of clean water. Signs protesting Line 9 drew attention to the potential for environmental damage posed by gas and oil pipelines, particularly due to a lack of adequate environmental assessment and proper consultation with First Nations. 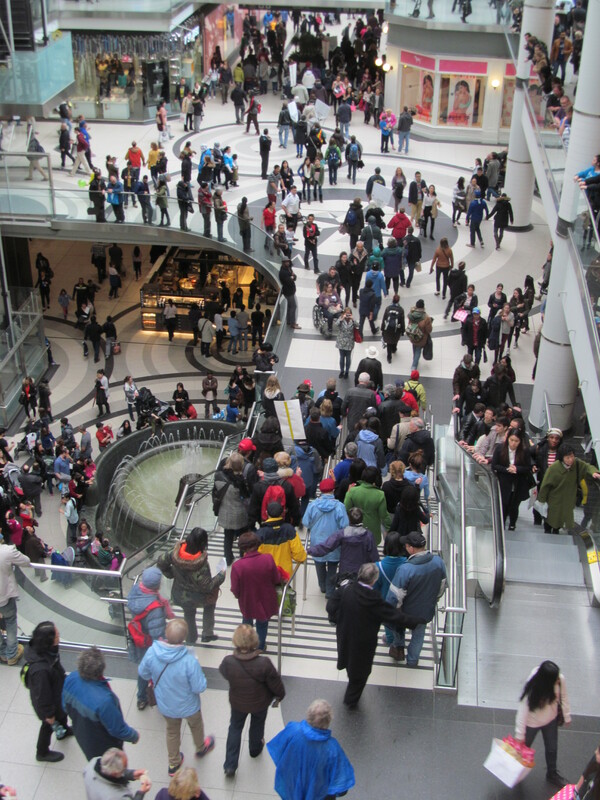 Walkers then marched through the Eaton Centre to Old City Hall where Migrante, gave a dramatic presentation to highlight the issue of unfair exploitation of migrant and domestic workers. At the federal courthouse at Queen West and Simcoe Streets, we heard from those supporting refugee claimants who have been the subject of secret trials and prolonged neglect of their claims. Returning to Holy Trinity where a Homeless Memorial lists over 700 people who have died on Toronto’s streets from homelessness. Bonnie Briggs, Sherman Hesselgrave and Michael Shapcott addressed this issue before the group entered the church for a closing ritual and meal of soup and bread. 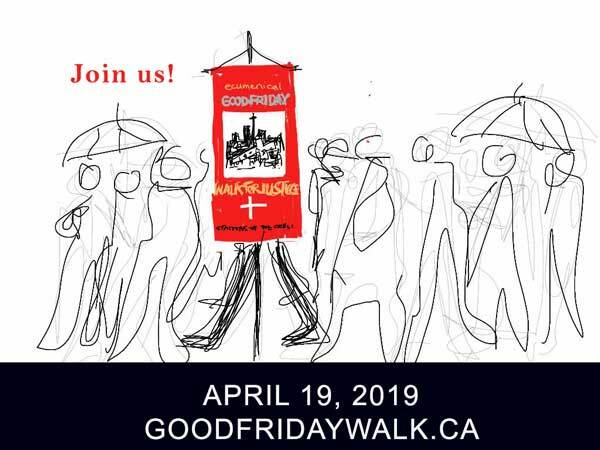 Human trafficking,devastation from the oil industry (specifically, Line 9 here in Ontario) and the plight of homeless persons will be held up in this year’s Ecumenical Good Friday Walk for Justice on April 18, 2014. 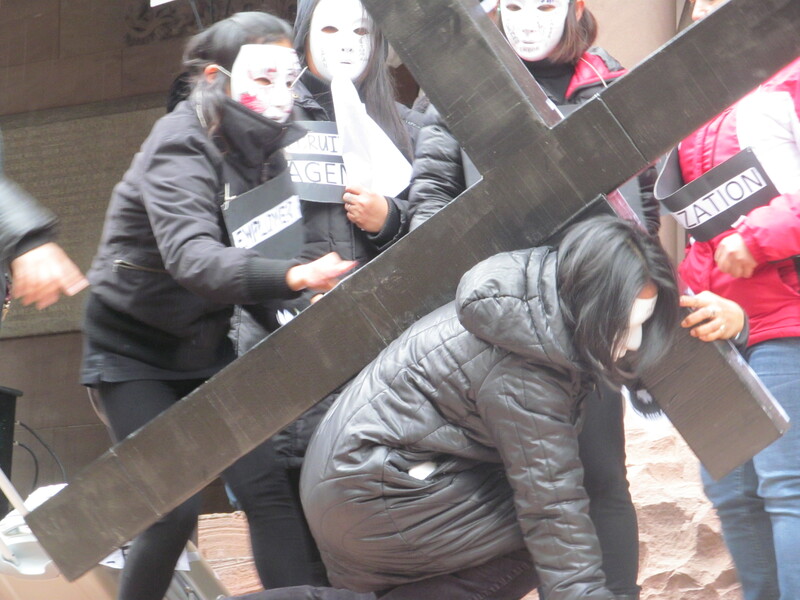 Jesus’ betrayal by one of his own disciples sets the theme, “Sold Out for Silver,” as Christians demonstrate the relevance of Jesus’ crucifixion to the sufferings faced by millions of people today. The Walk will focus on the modern-day betrayal by institutions and systems that put profits before people. “The three focus stations this year offer us the opportunity to recognize, lament and be empowered to transform how marginalized people and God’s good creation are currently devastated by the corporate, consumer and personal greed that ‘sells out’ thousands and even millions of lives and our collective future in the name of short-term profit for only a few,” says the Rev. Brian McIntosh, a long-time member of the Walk planning team. The Walk begins at 2 p.m. at Church of the Holy Trinity beside the Eaton Centre. Participants will visit three “stations” representing each of the issues before returning to the church at approximately 4:30 p.m. for a closing ritual and simple meal of soup and bread. 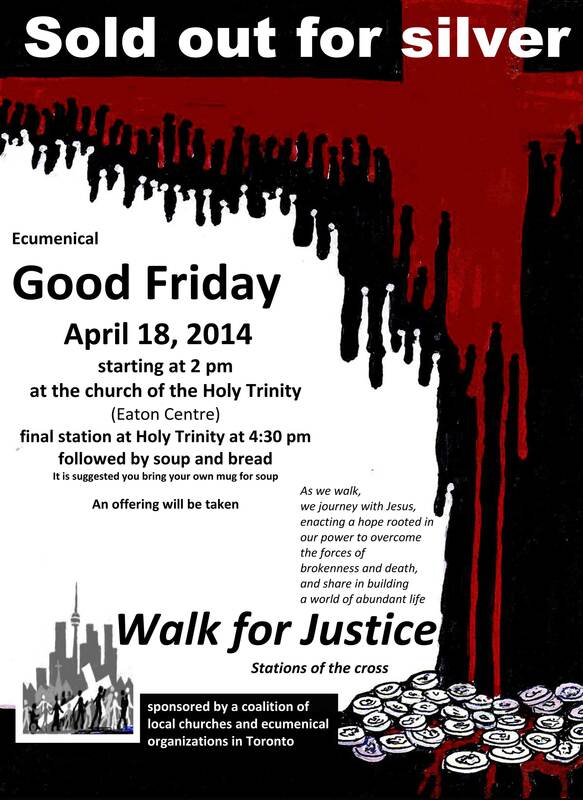 The Ecumenical Good Friday Walk for Justice began 35 years ago. The planning team for this year’s walk includes people from the Anglican, Mennonite, Presbyterian, Roman Catholic, and United Churches and Christian Peacemaker Teams.